Is the Cross Overused? Should it be Used at All? 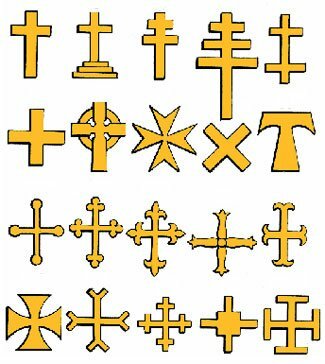 A selection of 20 different cross forms (not all Christian), and with apologies in particular to followers of Orthodox Christianity, because their cross form (and many others) are not included in this image. A 2006 survey of what people thought to be ‘overdone symbolism’ in church logos had the sign of the cross a clear ‘winner’, earning 57% of the votes cast, followed by the dove, at 29%. The other three choices between them shared the other 13% of votes (hill, water, and in last place, the lamb). However, as common as cross symbols are, to call the cross ‘overdone’ is a bit like saying the church talks too much about God. The cross is a perfect graphic element, and it is directly relevant to the Christian faith. It can no more be overdone than can the Coca-Cola logo be overdone in Coke’s marketing and branding, or any other logo/symbol in conjunction with the business, product, service or concept it is being used to convey. The underlying meaning of the cross is the core Christian message it highlights and represents – our salvation through the sacrifice, on the cross, of Jesus Christ, dying as our proxy. The very nature of its almost universal and unambiguous association with the Christian faith makes it highly functional – is there any other more direct and obvious way of identifying someone as Christian, or of something as related to Christianity? Its very simple form allows for great versatility in how it is adapted and placed in designs and layouts. It can be drawn by hand, and even if poorly depicted, still retains its obvious identification. The cross design is also free of color dependencies – unlike, for example, Starbucks which relies on green, or McDonald’s (red background and golden arches), the cross can be any color and with any color background. The cross symbol is possibly the most recognized symbol in the entire world. We tried to research what the most recognized symbol in the world is, and got a huge range of possible answers. In case you are wondering, claims ranged from the heart symbol (which actually dates back to Roman times – it is believed to represent the seed of a plant that was used as a contraceptive) to the Red Cross sign (a nonsense suggestion because in much of the world, “Red Cross” actually have to use a different symbol so as not to offend Muslims) to the Google or Coca-Cola logos and the Batman symbol. We’ve also seen surveys such as this one which offers a really strange set of five choices – Santa Claus, McDonald’s Golden Arches, Snoopy (really??? ), Mickey Mouse and the Coca-Cola logo. The really strange survey points to part of the problem of ascertaining the true popularity and recognition of symbols and logos. If a symbol isn’t included in the survey, clearly it isn’t going to score well! So all such surveys depend first of all on the survey designer’s choice of which symbols to offer as options. The other part of the problem is that to truly measure worldwide recognition, the survey would have to be worldwide, and to reach people in out-of-the-way places, people who are not connected to the internet, and who perhaps can’t even read or write. This points to another problem too – most surveys of global popularity tend to be limited to western countries and moderately affluent people who can be reached by phone or internet or mail. It may well be, these days, that some commercial logos are becoming well-known, at least in places where their product is sold, to the point of now approaching the degree of recognition of the Christian cross. Yes, McDonald’s (although, surprisingly, there are many more Subway stores than McDonald’s) and Coca-cola (and Pepsi) are ubiquitous, and Starbucks only slightly less so. But so too are churches. In the US, there is something in excess of 100,000 churches, compared to 14,150 McDonald’s restaurants, 26,700 Subway restaurants, and 13,000 Starbucks outlets. As for the 2006 survey, while we do believe in the ‘wisdom of crowds’ concept, we also believe that when it comes to matters of Christianity, the devil is never far away and is always seeking to distort and distract from our ability to clearly share our message and faith. The devil doesn’t like the cross – you conduct exorcisms with a cross. He doesn’t mind doves and other symbols nearly as much – imagine an exorcism involving a dove or a hill! It also hints at our concern about the quality of teaching in many of the mainstream churches. What Christian can not love the cross and all it stands for (if they indeed know this)!? Is the Cross Pagan in Origin? Does it Matter? Although the cross is almost universally used by church groups, its universality doesn’t guarantee its appropriateness (although it certainly is a very persuasive point in its favor). Some denominations have concerns about the origins of the cross and prefer not to adopt it. There are two main reasons for their concerns. The first is that the cross is pagan in origin. There is no doubt that crosses have been used as symbols, long before Christianity. This is unsurprising, because it is one of the simplest geometric forms – the intersection of two lines. Crosses have been used for non-Christian purposes, prior to Christ, in religions from Babylon, India, Syria, Egypt, and assorted other places. Circles, triangles, and other geometric shapes and patterns are also to be found in abundance. Crosses have also been used for non-Christian purposes subsequently, too – the Red Cross organization, for example (and an identical logo used by Johnson & Johnson). The Luftwaffe in WW2. A cross is commonly found on flags (although often being a cross relating to a saint). The cross didn’t and doesn’t belong to pagans, nor to more recent users of it, either. And although used by pagan groups, it is not pagan in origin. Its origin is in one of the simplest, natural, and abstract geometrical shapes. The cross also doesn’t belong to the Christian church. It is a universal symbol that can’t be copyrighted or trademarked. We Christians have to share it with other users and their other uses and meanings. We know there are some cases where pagan practices and festivals have been co-opted by some church groups into their ceremonies. If the pagan antecedents have been thoroughly eliminated and there is good Biblical foundation for the Christian practice, we see little harm in this. But if it is something based on an earlier pagan tradition and without any Christian/Biblical foundation, it probably should be discouraged. However, in this case, the reason for Christians using the symbol of a cross is not because of its former role in pagan rites, but because it represents the actual form of the cross on which Jesus was crucified. Well, maybe not. Some scholars are not certain about that point, either, and therein lies the second concern of groups that avoid using cross symbology. It is true there are Biblical references to trees or poles (as well as crosses) being used to crucify people, and while the very word “crucify” implies the concept of a cross (the derivation of the word “crucify” is from the Latin word crucifigere, which comes in turn from the Latin crux or cruc-, meaning “cross”), it doesn’t guarantee the exact method of execution, every time. To use an example, you could say a person was sentenced to death by lethal injection, but such a sentence doesn’t guarantee which particular chemicals were used, or in what sequence. “To be hung by the neck until dead” could mean from a tree branch, or from a gibbet or gallows. Similarly, sentencing a person to a death by crucifixion never specified an exact form of object on which the person was to be crucified. As best anyone can tell, the Romans used a number of different shapes and types of structure on which to crucify people (this article tells you more than you probably wish to know about the gruesome practice of crucifixion). The descriptions of Christ’s crucifixion in the Bible are based on the Greek word used in the New Testament for cross, which is “stauros”. That word can mean either a pole or a cross used as an instrument of capital punishment, so it doesn’t clarify the exact form of Christ’s crucifixion. One of these [clues] is found in John 21. Jesus gives Peter a glimpse of the manner of his death: “‘When you are old you will stretch out your hands, and someone else will dress you and lead you where you do not want to go.’ Jesus said this to indicate the kind of death by which Peter would glorify God” (verses 18–19). The fact that Peter (who tradition says was crucified) would “stretch out” his hands indicates that Roman crucifixion usually involved outspread arms such as would be positioned on a crosspiece. The other clue that Jesus was crucified on a cross is found in John 20. Thomas, in his famous moment of doubt, said, “Unless I see the nail marks in his hands and put my finger where the nails were, and put my hand into his side, I will not believe” (verse 25). Note Thomas’s mention of the nails (plural) that had scarred Jesus’ hands. If Jesus had been crucified on a stake or a pole, only one nail would have been used. The fact of two nails in the hands suggests a traditional cross. Another clue is when we are told about Simon of Cyrene carrying the cross of Jesus (Matthew 27:32). This was typically only the cross-bar piece, not the main pole, which would have been too heavy (typically about 200 lbs) for a single man to carry or drag. So, it seems to us that the shape of the cross on which Christ was crucified was probably an “x” or a “+” type cross. Even if it was a pole, we don’t see the harm in using what is generally understood to be a classical type of cross, because when we talk about the crucifixion and its fundamental importance to us as Christians, it is definitely better represented by a “+” than by a single line “|”. Galatians 6:14 suggests that we should be proud of the message of the cross, and 1 Corinthians 2:1-5 suggests that, when reduced to its fundamental essentials, the core message of Christianity is Jesus Christ and his crucifixion. Surely, in such a case, the best way of symbolizing that core message is via a cross. And he who does not take his cross [expressing a willingness to endure whatever may come] and follow Me [believing in Me, conforming to My example in living and, if need be, suffering or perhaps dying because of faith in Me] is not worthy of Me. A similar example is in Mark 8:34 where the AMP translation explains that the phrase “take up his cross” again means “expressing a willingness to endure whatever may come”. So – Is the Cross Good or Bad? Paul tells us in Galatians (Gal 6:14) of the paramount importance of Jesus and his crucifixion when preaching the Word of God. The cross is a symbol of this, and of the duality of our faith – as an instrument of crucifixion, it represents the death we are all destined to, and as the specific cross that Jesus was crucified upon, it shows us our salvation from the sentence of death that we can receive through Jesus Christ. The Cross is a pardon; it’s a reprieve from death for people who don’t deserve it. None of us deserves to be saved. None of us deserves to go to heaven. But God is love (1 John 4:8), and God is grace and mercy. “Grace” means something that you don’t deserve, something that God just gives you. God offers you a pardon. He offers you forgiveness; He offers you assurance of Heaven if you die. And that can happen right now, right here. “God commended His love toward us, in that, while we were yet sinners, Christ died for us” (Romans 5:8). While we mean no offense to groups who shun the cross, we believe it to be a God-given and powerful symbol of the transformative power of our faith; a symbol that has, over the centuries, become universally recognized as a representation of the Christian faith. It is a symbol to be used with pride. The Christian cross is one of the best known symbols in the entire world. It seems to be endorsed in the Bible as a representation of the power of God and the redemption we all desire and are offered through the sacrifice, on a cross, by Jesus Christ. Although used by other groups, both before and after Christ’s crucifixion, including other religions, its power and its “brand-recognition” is undiminished by this ‘sharing’. Is it over-used? Absolutely not! If anything, it is under-used. Its power deserves to be proudly displayed, by all Christians.